I’ve had a quiet fascination with all things Dutch for most of my life. Between the tulips and the windmills and summering near Holland, Michigan, I suppose it couldn’t be avoided. 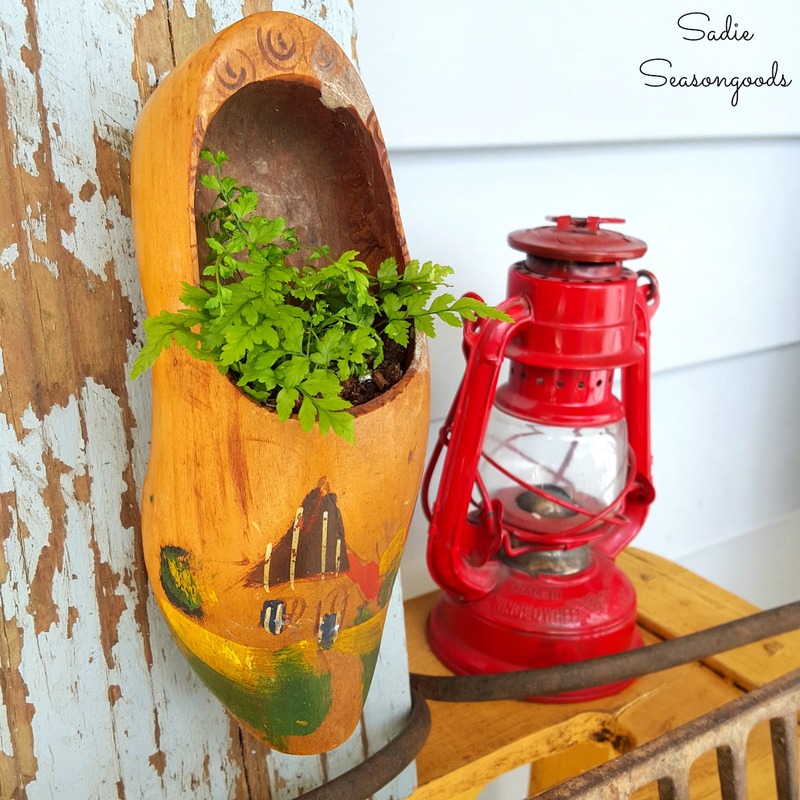 I also had my own pair of Dutch wooden shoes, and while I no longer have them, I still wanted to upcycle some into wall planters for some front porch decor. Yes, this is me as a Dutch girl for Halloween with my personalized Dutch wooden shoes. Incidentally, these came in quite handy for St. Nicholas’ Day, too! Dressed to the nines…or is that negens?? I had previously seen this idea – to repurpose Dutch wooden shoes for some craft room organization – I just had to give my idea of converting them into unique planters a go! I no longer had my “Sarah” shoes anymore, but with a little help from Etsy, I was able to acquire a couple of vintage Dutch shoes. These are the smaller (6″ long, or so) souvenir versions – I’ve actually seen these in thrift stores occasionally, too. With the changing of seasons on my mind, I was ready to upcycle them into wall planters or unique planters that would serve as front porch decor this Spring! 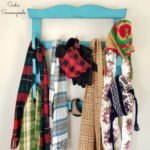 This post contains affiliate links for your crafting convenience. The shoes were perfect as-is…no need to alter them at all for this project. So, I just needed to select a couple of dainty plants that would look cute in the shoes. Dutch wooden shoes would likely be PERFECT as succulent pots, but I elected to go with some dainty green plants (not succulents) from a local urban gardening shop. The only thing I really needed to do to my Dutch wooden shoes to turn them into unique planters or wall planters was drill a few holes through the “sole” of the toe. This would serve as drainage for my little plants. I simply used my power drill and a small bit to do so. No one will ever know…but my plants will thank me. Since I had decided to incorporate my Dutch wooden shoes / unique planters into front porch decor, I needed to prop them up on something. Thankfully, each vintage wooden shoe had a hanger nailed into each heel…which saved me a step! So all I needed was some scrap wood to hang them from…which we just happened to have plenty of after Mr. Seasongoods replaced our shed ramp last year. Ta-da! The perfect plank of wood…right out of our backyard. Chippy and summer sky blue- I mean, it’s perfect! So I tucked my plants into each shoe, using potting soil to fill in and supplement. I added a couple of other pieces to my Spring vignette and my front porch decor was done! Dutch wooden shoes truly do transform into seriously adorable wall planters or unique planters – with little to no work involved! My simple little Spring porch vignette. And here’s a little watering tip for any dainty plants you may have! I’m a biologist in real life and worked in a water quality lab for several years. And these little plastic pipettes are incredibly handy around the house… and now I use them to water my tiny plants! They hold just a wee bit of water, and you can “inject” the soil instead of simply watering from the top! I love the cheerfully bright colors, too. Normally, front porch decor for Spring focuses more on the pastel colors of flower blossoms, so this is a nice aberration from the norm. 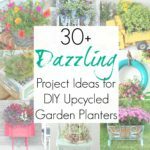 Interested in more upcycled gardening project ideas? Check out my full collection here for some outdoors inspiration! And if you’re more interested in Springtime projects, this collection of repurposed Spring decor ideas is right up your alley. Really a neat idea. Thanks for sharing. Oh, I could just kick myself! I passed up a pair of wooden shoes at a flea market last weekend! Argh! GREAT idea! I have a pair “floating” around somewhere in this house! I think I’ll find them & try this! That is such a cute idea! Here’s my tips for succulents – lotta sun (5 hours or more) and very little water (like once every two weeks. if not less than that. Think cactus when you water…. Cute idea! I have not seen any wooden shoes in YEARS! Oh gawd, we have some uber big wooden shoes we brought back from Holland. Such a great idea!!! LUV IT!!!!! Yay! I’m happy to see your adorable Dutch planter at Thoughts of Home on Thursday. We love having you. Your creativity amazes me and makes me think outside the box. Pinning. What a clever use of wooden shoes, I think I have seen them with succulents as well. Wow, that is cute and so creative! I love it! Adorable, love your little planters, made me smile! We live in Saginaw and when I was in junior high (a hundred years ago!) we took a field trip to Holland every spring. It was magical! We spent our summers in St. Joe, MI…just love Michigan (well, maybe not the winters 😉 )! Love what you did with the shoes, I am from The Netherlands, so naturally everything Dutch touches my heart. Found your blog through Creative Spark. Super cute and ingenious use of a wooden shoe! Very spring-like. Visiting from Creative Ways party. 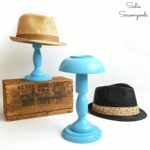 Great upcycle! I’ll have to keep a lookout for some wooden shoes to try this. We live in an apartment so vertical gardening is key. This fits that theme perfectly. Done and done- thank you for the invite! This is a great idea! Thanks for sharing at Creative Ways Link Party. A wonderful idea. It is so unique. Sarah, this idea is so cute! I seriously have a pair of wooden shoes that I bought in Amsterdam back in the day! They are sitting on a shelf in my craft room collecting dust. I have never thought outside the box when it comes to using them functionally. Thank you for the inspiration! I must ask…does your brain ever get fried? You are full of endless possibilities!!!!!! I’m kicking myself because I just passed up a pair of wooden shoes at Goodwill. I just love this idea. Thank you for sharing at Vintage Charm. Tweeted and pinned. At my favorite place for all things beautiful (Southern Exposure, the subject of my TOTOH post this week!) they do fun things with wooden shoes and I almost bought some at the gift shop this week except — well, I’d bought rather a lot of other things (and besides, I’m going back!) After seeing this I will make certain the wooden shoes are in my cart! It’s just lovely and looks so very perfect here! What a clever idea Sarah! We used to have a pair of those clogs in our garden house on the wall, when I was a kid! I wish I had them now, cause I’d totally copy your idea, it’s so lovely! Thanks so much for sharing this at Sweet Inspiration #1! This is such a cute craft Sarah! I may have to dig out my shoes from Holland. Your post is such a happy addition to Thoughts of Home on Thursday. Thank you SO much for sharing the joy. These are adorable. I happen to have 5 pairs of wooden shoes. ‘Why?’ you ask. Well, I have the pair my parents bought for me when I was 7 years old and visited the Netherlands – and then when my husband and I took our children there in the 90s we bought a pair each. They languish on a shelf in the basement, but I think that the largest and smallest will make a nice set of planters. Thank you! Sarah, these wooden shoes turned planters are awesome!!! The wooden shoes and chippy blue board were meant for each other, looks perfect!! I had a pair of these an elderly neighbor gave me years ago, but with all the moves, I don’t know what happened to them. Wish I had them now! Maybe they’ll turn up, Suzy!! Such a beautiful and creative idea! I love the look of them mounted on the plank board (and I too seem to have lost my green thumb when it comes to succulents). Oh my gosh, this is the most darling idea. I love the picture of you in your shoes too! Thanks for sharing at The Creative Circle.